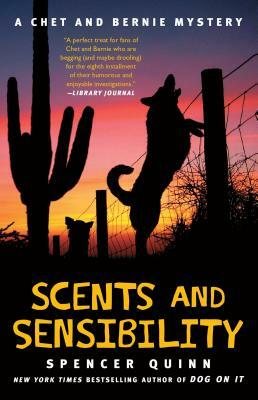 In the eighth installment in the New York Times bestselling mystery series that makes “even cat lovers…howl with delight” (USA TODAY), Chet and his human PI companion, Bernie Little, find themselves in a prickly situation when a mysterious case of illegal cactus smuggling comes to their attention. Chet and Bernie discover bad things going on in the wilderness, far worse that cactus smuggling, and all connected to a strange but innocent-seeming desert festival called Cactus Man. They unearth leads that take them back to a long-ago kidnapping that may not have been a kidnapping and threaten a ruthless and charismatic criminal with a cult following, a criminal who sees at once what Chet and Bernie mean to each other and knows how to exploit it. “If you like dogs and also whodunits, you’ll enjoy Scents and Sensibility, a mystery starting out small and building to a large and fiery climax at a music festival in the desert. Action-packed with a touch of the hard-boiled detective at its core plus witty canine dialogue, its narration is both creative and whimsical in a way only a true dog-lover and talented writer such as Spencer Quinn could achieve." "One of the best dog-driven mystery series available, with sharp writing from the multitalented Abrahams, plenty of humorous asides (often from Chet on the all-important topic of food), and mystery plots that are genuinely intriguing." “For dog lovers looking for whimsical summer reads, you may discover the world as seen through a dog’s nose and point of view. You’ll be amazed at what your furry friends really think about you and life in general." “Light-hearted, humor-filled…the ending of this book is especially touching. Most readers will want to read it over (and maybe over yet again, to be sure they are understanding it). It's beautifully written and very emotional." “A doggone clever detective duo… always a hoot. This onesalts a doggedly determined investigation with plenty of laughs”. "Even cat lovers will howl with delight." "Spencer Quinn speaks two languages--suspense and dog--fluently." "Pulls the reader along as if on a leash."